Poe's Red Death returns, more powerful than ever. Can anyone stop him before he summons an apocalyptic nightmare even worse than himself? In The Left-Hand Way, the second book of Tom Doyle's contemporary fantasy series, the American craftsmen are scattered like bait overseas. What starts as an ordinary liaison mission to London for Major Michael Endicott becomes a desperate chase across Europe, where Endicott is both hunted and hunter. Reluctantly joining him is his minder from MI13, Commander Grace Marlow, one of Her Majesty's most lethal magician soldiers, whose family has centuries of justified hostility to the Endicotts. 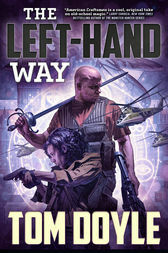 Meanwhile, in Istanbul and Tokyo, Endicott's comrades, Scherie Rezvani and Dale Morton, are caught in their own battles for survival against hired assassins and a ghost-powered doomsday machine. And in Kiev, Roderick Morton, the spider at the center of a global web, plots their destruction and his ultimate apotheosis. After centuries of imprisonment, nothing less than godlike power will satisfy Roderick, whatever the dreadful cost. Praise for American Craftsmen, book one in the series: "An exhilarating mix of magic, military action, American history (the fun kind), and a Jason Bourne-like race to stop the real bad guys." Jack Campbell, New York Times bestselling author of The Lost Fleet Beyond the Frontier: Guardian and The Lost Stars: Perilous Shield. "Tom Doyle blends an intricately re-envisioned history of America with literary references, some bold, some sly, in this genre-bending thriller. It's a feat of craftsmanship to be celebrated!" Jacqueline Carey, author of the Kushiel series. "Tom Doyle's American Craftsmen is an exciting cross between dark urban fantasy and special ops thrillers. I thoroughly enjoyed it." Eric Flint, author of the 1632 series. "American Craftsmen is a good adventure story; the characters held my attention and I liked the way real history merged with fantasy." Larry Niven, author of the Ringworld series. The Internet Review of Science Fiction has hailed TOM DOYLE's writing as "beautiful and brilliant." Locus Magazine has called his stories "fascinating," "transgressive," "witty," "moving," and "intelligent and creepy." A graduate of the Clarion Writing Workshop, Doyle has won the WSFA Small Press Award and third prize in the Writers of the Future contest. He is the author of American Craftsmen and The Left-Hand Way.